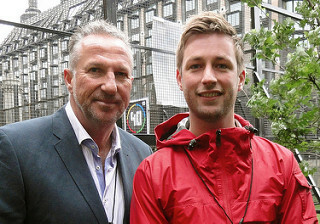 Sir Ian Botham launches Cage Cricket! Sir Ian ‘Beefy’ Botham swapped cricket whites and open green fields for a metal cage yesterday, as he launched the nationwide campaign to bring Cage Cricket facilities to towns and cities across the UK. The cricket legend watched as MPs and Prisons Minister Crispin Blunt did battle with young people from across London, in a cage erected in the Speaker’s Garden at the Houses of Parliament. Blunt said he was impressed by the trials of Cage Cricket in prisons and added his support to the campaign to make it a national sport. A Spacehive funding campaign, fronted by Sir Ian, will kick off in Portsmouth soon, where the Cage Cricket team is working towards building Britain’s first cage! Check out his funding page here.